Nurse burnout affects the whole person. Physically, mentally, emotionally, and energetically the nurse can be depleted from the long hours, heavy workload, and taxing environment. Unsurprisingly, The Bureau of Labor Statistics ranked nurses fifth of all occupations in 2010 in the number of workdays missed due to occupational injuries and illness. And sadly, in a 1997 study, the American Nurses Association estimated that as many as 20 percent of nurses may have some substance abuse issues. 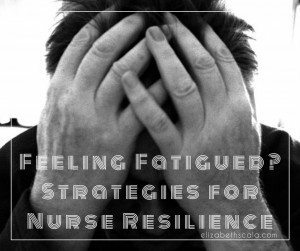 The nursing literature is filled with evidence of nurse burnout, compassion fatigue, and workload stress. Nurses take care of some of the sickest patients and often their work goes under-appreciated or unacknowledged. However, organizations have taken note. For example, the Cancer Treatment Centers of America at Midwestern Regional Medical Center in Zion, IL is tackling emotional exhaustion by giving RNs the time, tools, and space to process their feelings in the comfort of nurse-designed renewal rooms. These onsite locations can be a place of respite where the nurse can go to journal, meditate, or take care of oneself. It’s great to see institutions getting on board with nurse self-care. 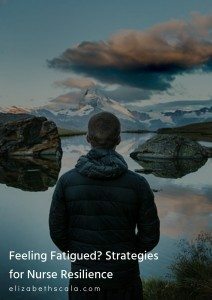 And I wanted to take this opportunity to share a few more resiliency strategies for the busy nurse. Utilize some form of prayer. While not every nurse is religious or part of formal religion, we all know what prayer is. And this definition of prayer can be unique to each of us. For some, it may mean formal prayed in a religious building. For others it could be closing our eyes and saying a few words to our higher power. Still others use spiritual practice such as meditation as a form of prayer. Whatever it is for you, I encourage you to use a quiet space in your life to reflect. Pause and be still. Call to mind what you are grateful for. Reflect on what you’ve learned. Bless your life for all the gifts that you have. This author shares five inspiring prayers for nurses. And heck… we can even think of an inspiring or uplifting quote as a form of prayer! Connect with your inner child and play! I love this notion of play. As adults, we can become much too serious. We beat ourselves up over our mistakes. We criticize our shortcomings. We judge our thoughts, feelings, and actions. Swiping a file from the Hula Hoop Girl… let’s make life (and work) more like play! In fact, this blogger shares an up-and-coming trend. Adult coloring. I have seen these lately in craft stores, large shopping markets, and even at the grocery store. And, before this was even a ‘fad’, I’ve done them myself! Check out this image of a coloring I did when my nephews were in town one summer for play! Cuddle up with a furry friend. Just loved what this article shared about our four-legged family members. Spending time with pets can lower our blood pressure! I mean, even though we all ‘knew’ that animals made us smile.. the science is out, my friend. Trust me. These are the facts. When I get home from a long day, my pal Rusty is wagging his tail at the door. Immediately this puts a smile on my face and I forget the worries of the day. Spend time with pets, children, and even the elderly- outside of work- and this can brighten your day! What did we miss? I’d love to hear how you increase your capacity for resilience. Leave a stress-reducing tip in the comments below. Thanks for reading! 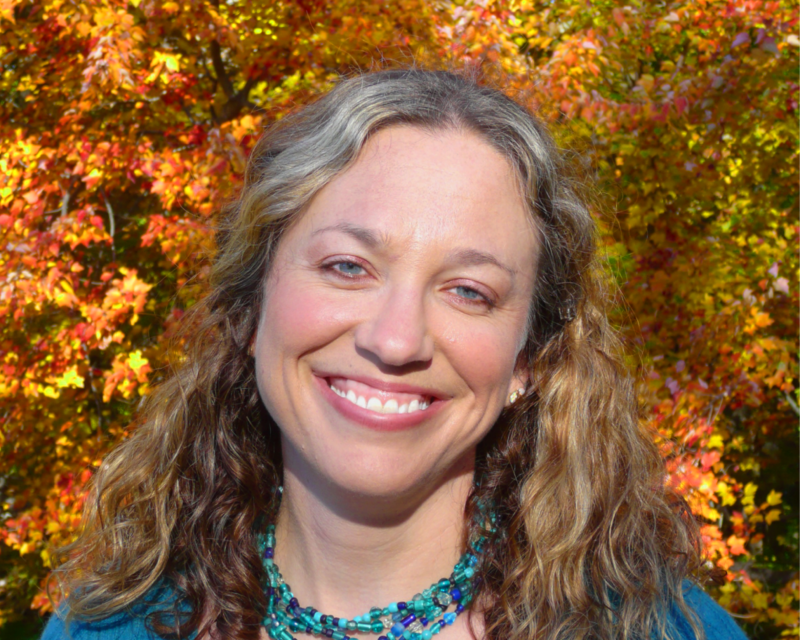 About the Author: As a keynote speaker, bestselling author and virtual conference host, Elizabeth partners with hospitals, organizations, associations, and nursing groups to help transform the field of nursing from the inside out. 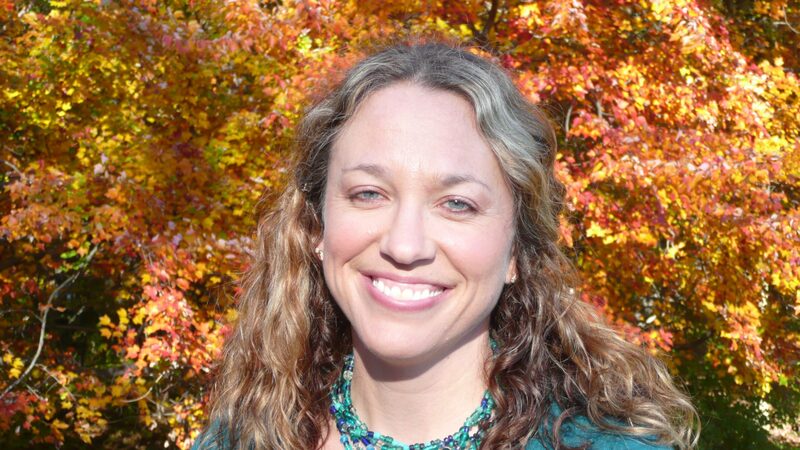 During the National Nurse’s Week online conference, ‘The Art of Nursing‘, Elizabeth supports nurses in achieving professional goals of continued learning and development. Click here to find out more about how The Art of Nursing appreciates and celebrates our profession in a meaningful way. Thanks, Maureen. Definitely love hanging with my pup too! I practice yoga and love to “play”. I would add laughter. Watch a funny movie or read a funny book…laugh until it hurts! Great point, Donna. I too love to laugh! 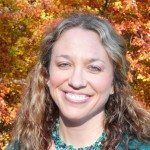 Great post, Elizabeth and it IS exciting to see organizations stepping up in their support of nurses. This is a sign of respect for the work we do and toll it takes and is a refreshing sign of a future where nurses practicing self-care is the norm! Fantastic. I enjoy zumba and improv classes to nurture my physical, emotional, and spiritual health!! And they are both a priority in my life! I absolutely love this! Nursing is an emotionally demanding career. It’s important to take time for renewal. I’m not the best at setting and keeping a routine such as daily yoga or meditation, but I am aware enough of myself to know when I need to pause. I love all three of your tips here. I find that I can most quickly refresh by getting outside, basking in the sunlight, taking a nature walk around our farm and noticing the new herbs and wild flowers that are popping up, and soaking up some cuddle time with our mama and baby goats. They are so enjoyable to watch as they play and nurture each other, and when they gleefully charge toward the fence when they see me, that in itself is enough to bring a smile to my face. These are wonderful resilience strategies, April. Thank you for sharing them! And good point about being mindful about when to take that needed pause. Thanks for offering that here. 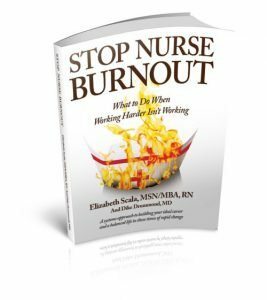 I am always amazed at how you are able to continually create such empowering content for nurses, Elizabeth! In addition to prayer, I’ve been using meditation. I really like Headspace.com they even have an app with 10 free meditations on it. I can’t find the image you completed of the adult coloring you completed with your nephews, though…I can’t decide if I’d really enjoying adult coloring, haha. OOoh, great resource, Dr. Silva! Thanks for sharing here. As always, I love how you give us tangible, right now suggestions that we can easily implement!! And I have to agree, love my family, but nothing sweeter than coming home to the fur babies and wagging tails too!! Thanks, Joan. Appreciate the feedback. Glad you enjoyed the post! These are great ideas. I find that working with plants, gardening in the summer, and watering plants inside in the winter is a source of renewal. Also, journaling is a source of reflection and renewal, as I sometimes write to my higher power and then ask for a response back. The answers are often so compassionate and useful. I love these additional tips. Thank you, Padma.